Join us at Oyster Club in Downtown Mystic and put your world knowledge to the test. 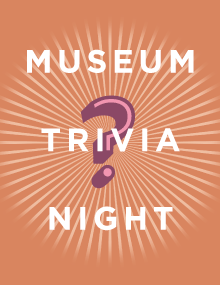 Trivia topics include art, nature, local history, and science. Facts have been assembled with the help of museum educators at Mystic Museum of Art, Mystic Aquarium, Mystic Seaport, and The Denison Pequotsepos Nature Center. Register solo, or as a team of up to four people; registration begins at 6:30; trivia starts at 7. Come for the trivia, stay for the fabulous food, drink and company.